In today's culture where everyone sometimes gets a trophy for trying their best which has the positive effect of praising effort and hard work, it's sometimes hard to teach your child and teen both to be gracious about winning and sportsmanship-like about losing. But this is real life. So how can we teach them well to win and lose with style ? 1. Encourage your child to congratulate their opponent when they lose. 2. Remind your child not to boast when they win, but say thanks to the praise they receive. 3. Talk about the game afterwards and help your child see specifically how they did well. 4. Discuss the game and ask your child where they wish they could have been more effective to prepare for the next game. 5. Encourage your child to do their best, but remind them we all have "off" days and that's fine. 6. Don't be the negative parent at your child's events -- cheer on good playing on both sides and refrain from arguing with coaches and referees. In general, we want to recognize good sportsmanship in our children and teenagers not only in athletic events but also in other areas of their education whether it's a spelling bee, a play with actors with greater and lesser acclaim, in creative art work, in musical productions, dance recitals, science competitions and other areas of achievement. As parents we like to think of ourselves as achievers and want to model the same for our kids. However, we all have strengths and weaknesses in different areas. When children see us tolerating frustration, working through difficult dilemmas, problem solving and feeling satisfied in the end, they identify with this patient attitude. Learning must entail frustration. First we don't know something; then we learn and we comprehend. Children identify with a calm attitude that takes new experiences as they come and appreciates sticking to a task until it's understood and carried out. High achievers aren't always the smartest, the most athletic, the ones who have the greatest endowments -- they're people who persist, work hard, stick to the task, stay organized, have well-developed concentration and attention and are sportsman-like when others move a little faster by working collaboratively. 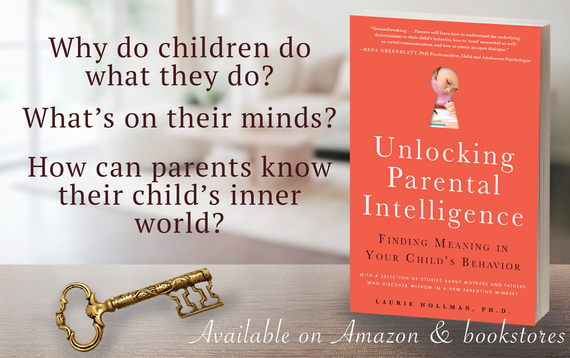 Laurie Hollman, Ph.D., is a psychoanalyst with a recent book, Unlocking Parental Intelligence: Finding Meaning in Your Child's Behavior, found on Amazon, Barnes & Noble, Familius and wherever books are sold.